We have officially entered the Armor Zone people! 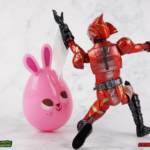 This marks our 3rd full gallery from the fantastic Amazon Japan series Kamen Rider Amazons. 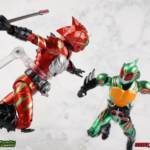 This week saw confirmation of yet another figure from the show with the Mole Amazon, and Season 2 is well under way with an exciting 2nd episode. 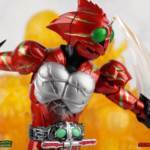 So at long last we’re going to take a look at the other sometimes heroic but often savage rider from season 1 with S.H. 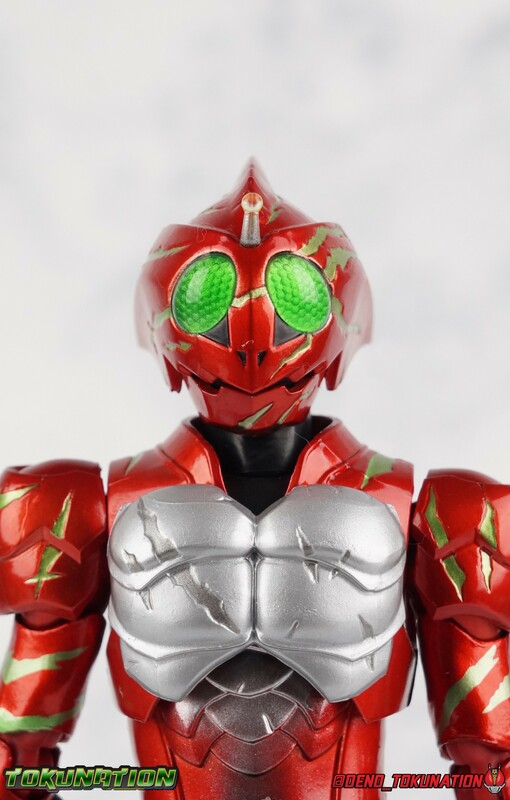 Figuarts Kamen Amazon Alpha (Amazon JP Edition)! Amazon Alpha (Jin Takayama) was definitely not what you’d call a traditional hero. By the end of season 1 he resembled more of a villain than anything thanks to his obsession with the Amazons. But that doesn’t detract from his magnificent design, or this figures. 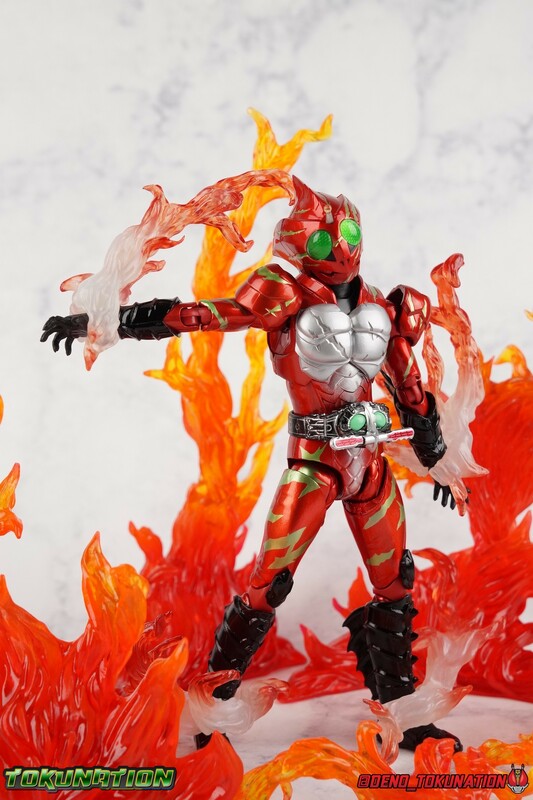 This release of Alpha, like the Omega we recently looked at, was an Amazon JP release that included some bonus flame effect parts. But even without those, Alpha is a fearsome figure that brings the character’s savage personality to life in your collection. 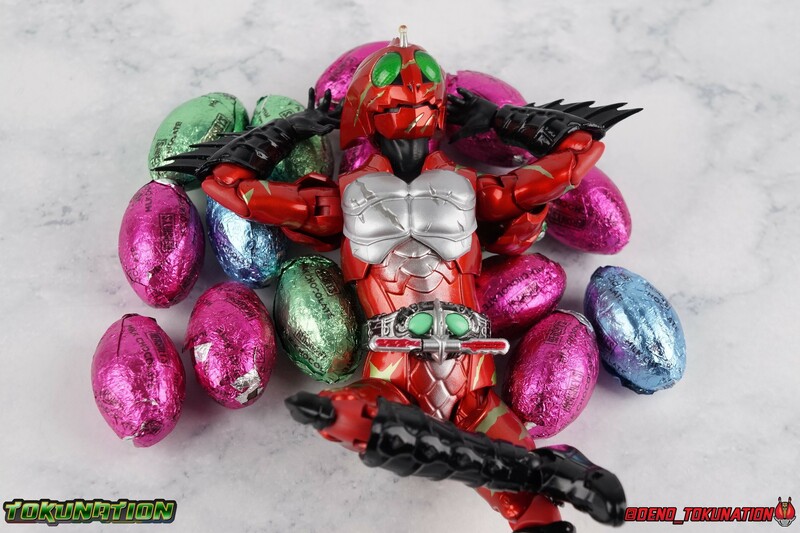 We’ve attached a number of images to this post, but you can view 70+ images in our full gallery by clicking “Discuss on the TokuNation Forums” at the bottom of this post. 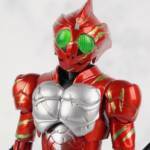 We’ll be switching gears after this and going back to another personal favorite series of mine, with a gallery from Kamen Rider Drive! We have officially entered the Armor Zone people! 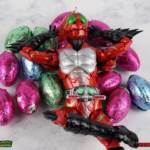 This marks our 3rd full gallery from the fantastic Amazon Japan series Kamen Rider Amazons. This week saw confirmation of yet another figure from the show with the Mole Amazon, and season 2 is well under way with an exciting 2nd episode. 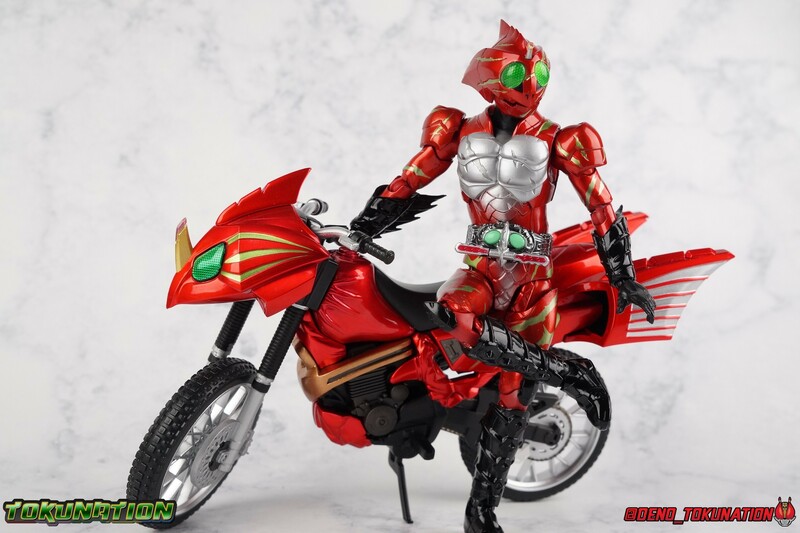 And at long last we're going to take a look at the other sometimes heroic but often savage rider from season 1 with S.H. 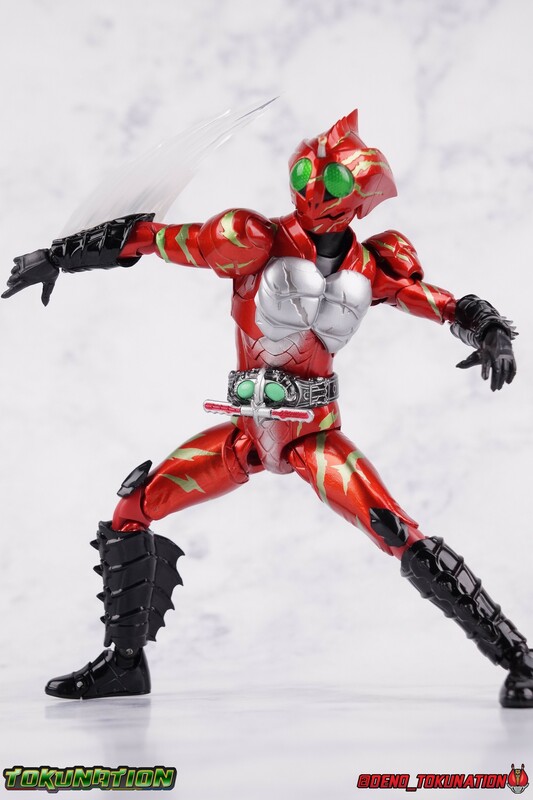 Figuarts Kamen Amazon Alpha (Amazon JP Edition)! This version of Amazon Alpha comes in a special corrugated brown box. 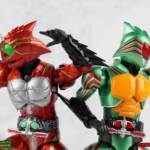 Just like the Amazon JP release of Amazon Omega. Going further back even Showa Amazon received this kind of special release. 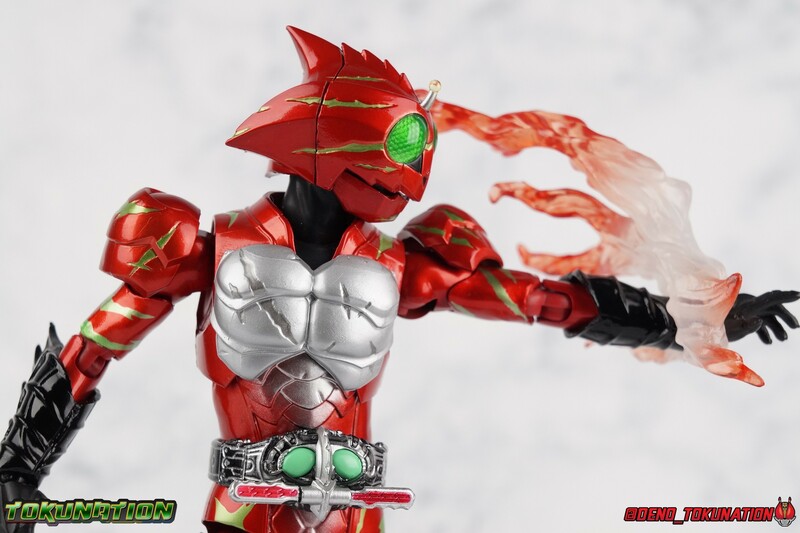 But as I said Alpha is packed in the exact same style of box as Omega, which is a bit wider than the normal retail release because of some additional red flame effects. But ultimately it's pretty plain looking compared to the standard retail version. 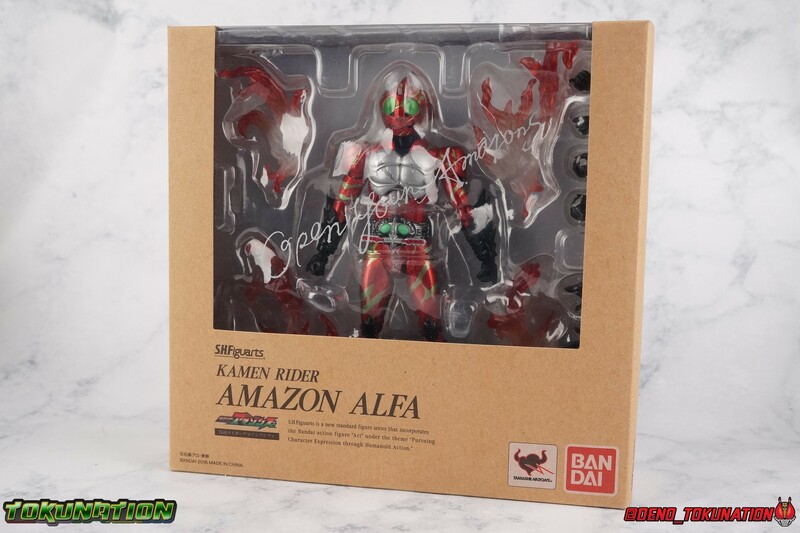 While we're here let's address the erroneous english spelling of his name on the box, "Alfa". 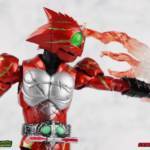 Clearly the intent with his name is for it to be Alpha to Haruka's Omega. "Alfa" seems to stem from soem sort of mis-translation into english equivalence, but much like "Junglaider" which should be properly spelled as Jungraider, we can easily infer the correct intent of the name. I'm so happy to have finally had the time to look at both Amazon Omega & Alpha in the same week! It's been great photographing both of them and Jungraider all in the same stretch. 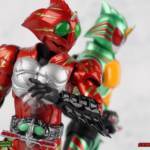 I loved Amazons season 1 as it aired and I'm already hooked by season 2, so handling the figure right now is perfect. Omega was a less than perfectly executed release, but one that still looks fantastic. Let's see how Alpha stacks up. 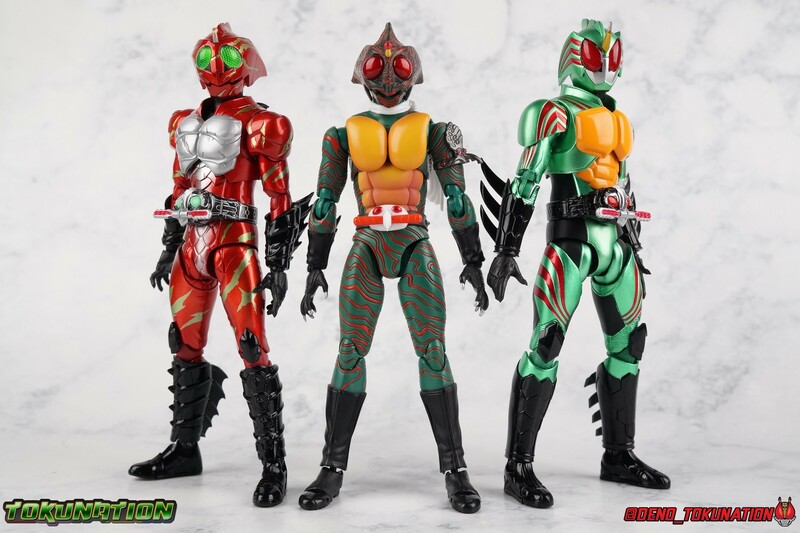 Amazon Alpha is a design that more closely resembles the original Showa Amazon. 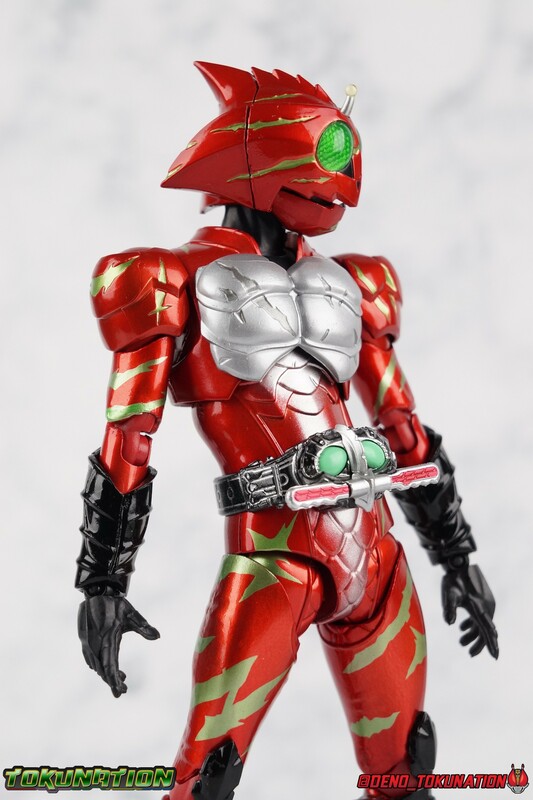 While Omega had a similar color scheme, it's clear that Alpha is the more direct homage. In fact, specifically, Alpha is based on the S.I.C. 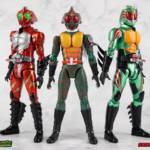 Hero Saga exclusive form of Pre-Amazon. A form which doesn't use the Gigi Armlet, is 1/3 as powerful as the full Amazon, and the user will die in 3 days if the armlet is not obtained. So they went very obscure for his inspiration, but it works. 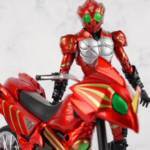 It's clearly the direct inspiration for this rider as I noted way back when it was first revealed last year. As for the figure itself, Alpha is just about as solid a release as Omega was. 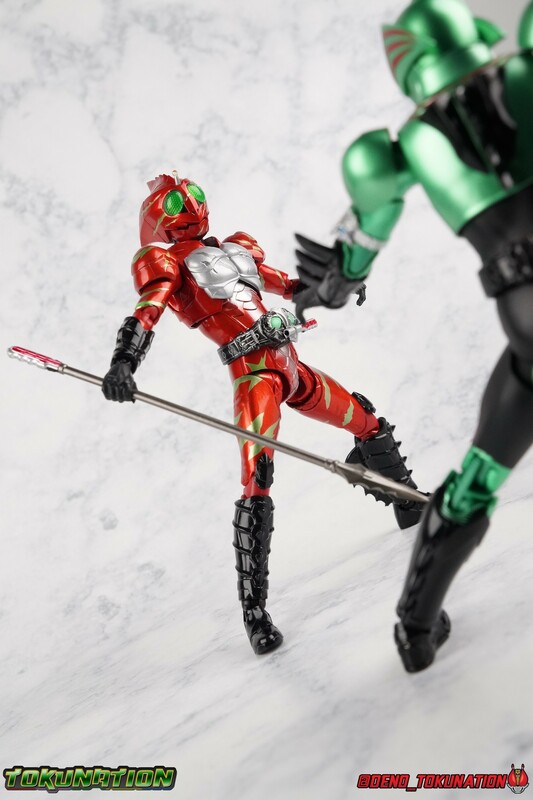 I take more issue with Alpha's leg design than Omega though. Sadly Alpha has some weirdly stunted ankles that can't quite bend back. The very tip of his heel points upward and impact the fins on the backs of his legs., making it difficult to balance him on occasion. Adding to this is the somewhat limited hips. Where Omega looked like he was wearing a diaper but had functional legs, Alpha is visually better looking but his hips impact the waist too soon to be really dynamic. 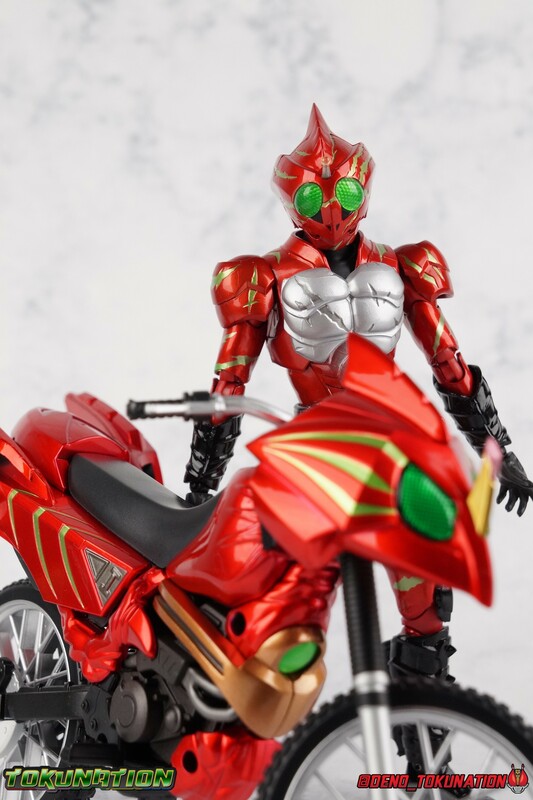 The Amazons Driver is once again gorgeous with this release. 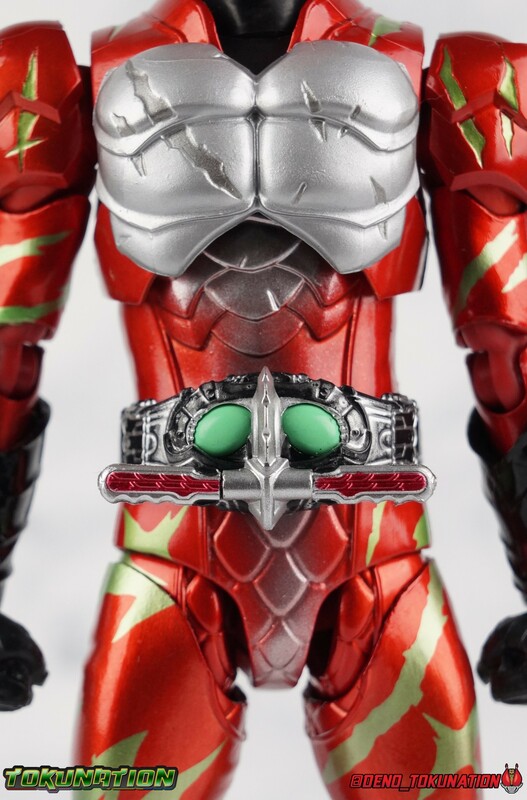 The colors are inverted from Omega so it gives Jin's driver a nice weathered look to it. You don't really notice how different the 2 are until you see them like this. 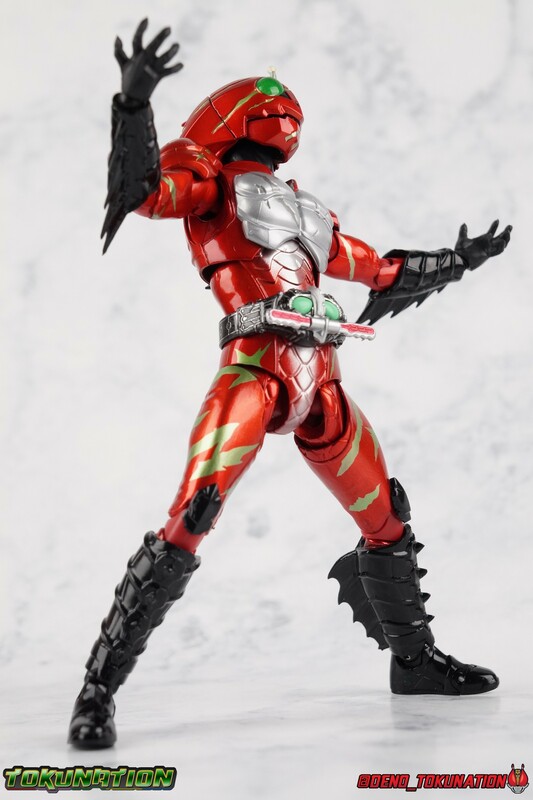 The right grip on the driver is removable like Omega's, though Alpha includes no Battler Grip weapons. 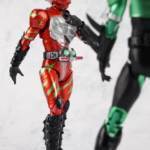 Alphas' torso articulation is where he gets a leg up on Omega. 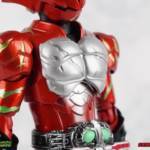 Omega felt a bit stiff and limited by the more mechanical looking nature of his torso armor. 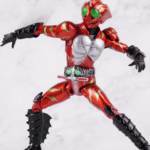 Whereas Alpha has a more organic feel too him and is less bulky, the upper body rotates around the abdomen really well. 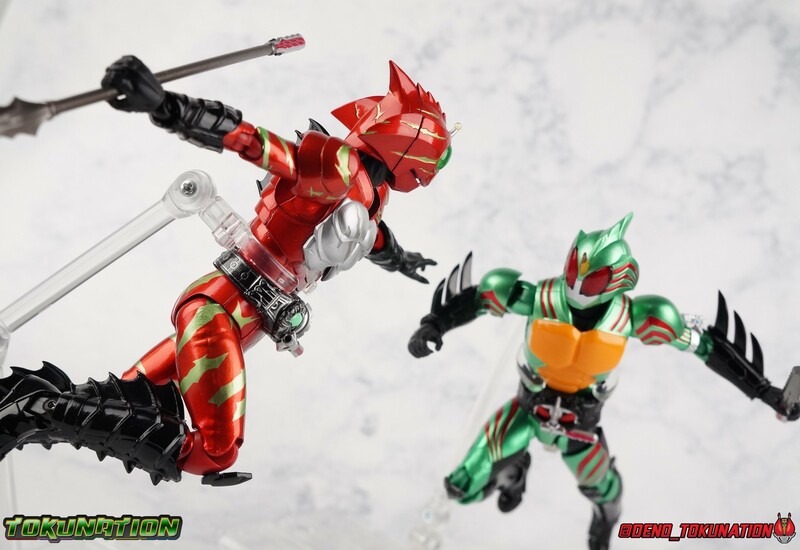 I love it when you can get figuarts in like wild feral looking poses and Alpha is great for that. 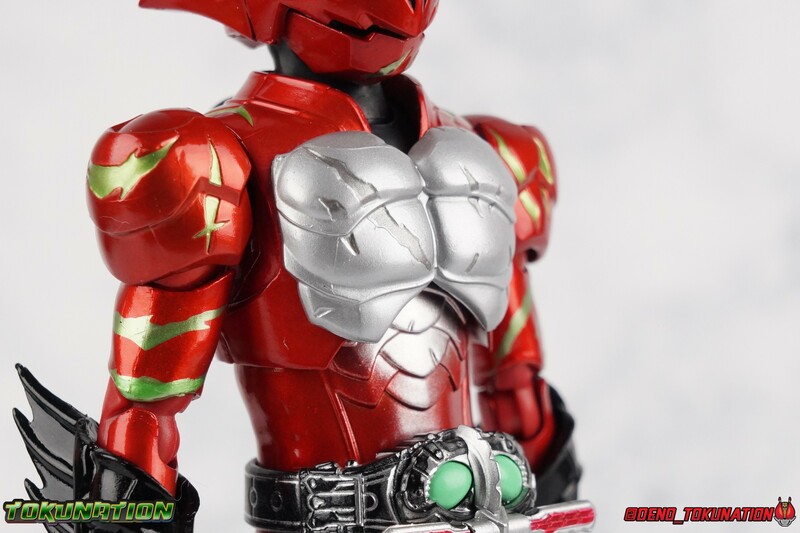 Alpha also has some excellently molded scaring on his torso that I think a lot of people expected to just be paint apps. Thankfully Bandai went the extra mile. 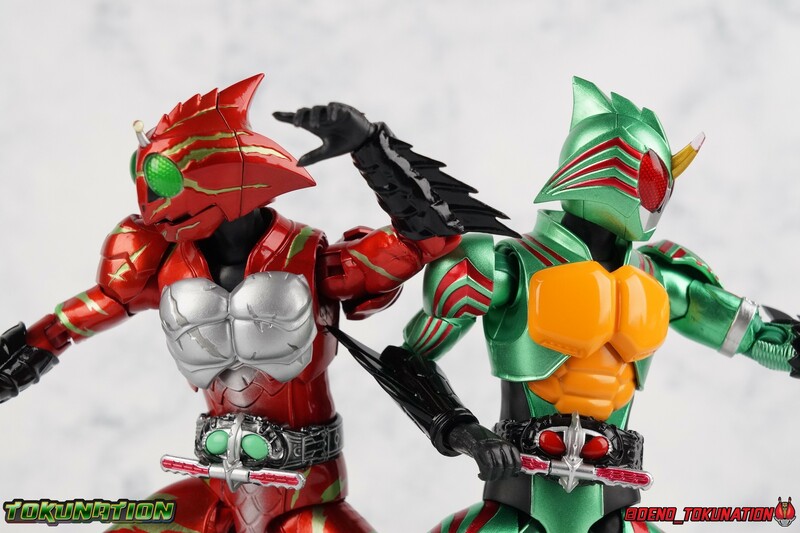 Alphas' Arms are designed a bit better than Omega's in my opinion as well. 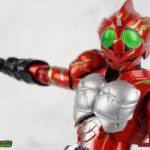 Omega had this pesky habit of his shoulder pads popping off when you stretched the arm out too far, and they were on a friction tab that moved so getting them back was difficult. Alpha's shoulder pads are on ball joints making matters much more manageable. 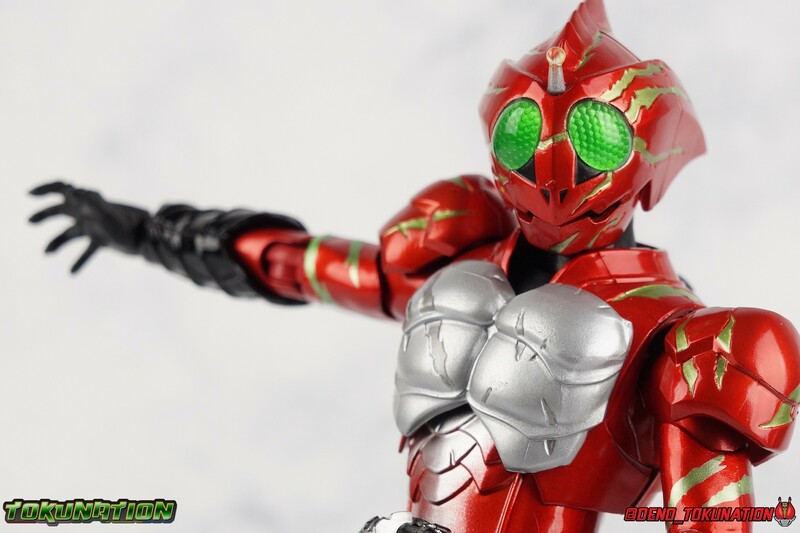 You get the same great range out of the elbow and wrists otherwise, unfortunately the ball joints on the wrists like to pop completely apart on mine every time I change the hands. Finally, Amazon Alpha's head is just spot on. 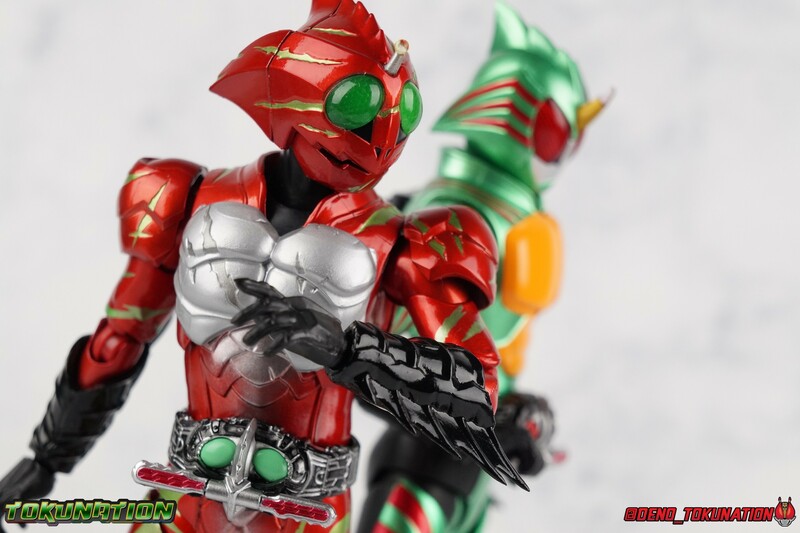 Whereas Omega's felt a bit squished, Alpha's is just right. 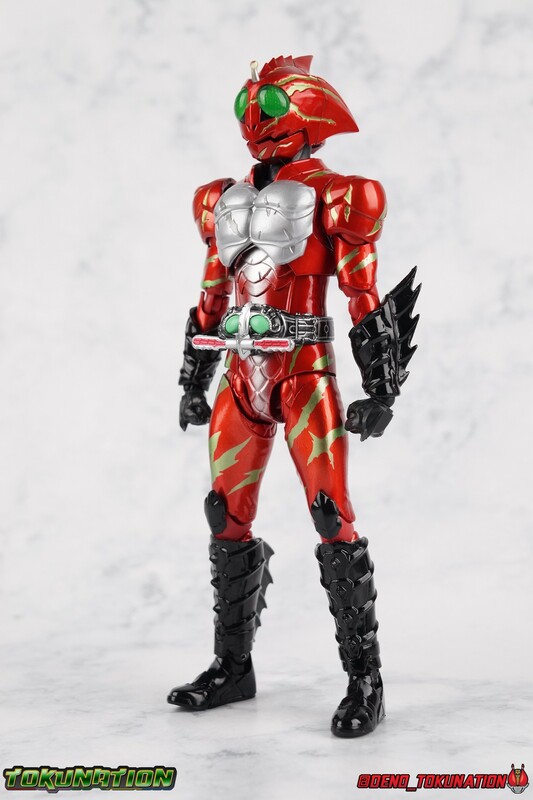 And thankfully his neck is designed with articulation in mind this time, so you can actually arch his head back or down to the side quite easily. You can see Jin's personality shine through in moments like that. 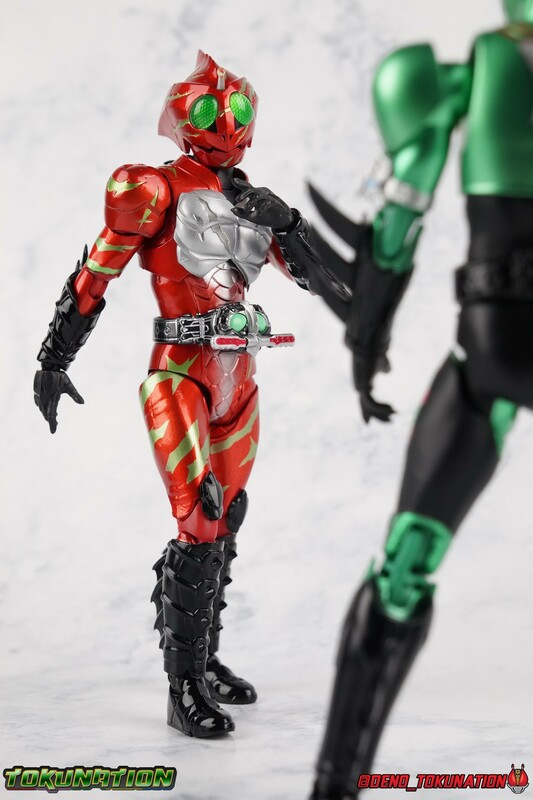 As with Omega I feel like this figuart does a great job of capturing the characters screen presence and body language, just slightly better even than Omega. 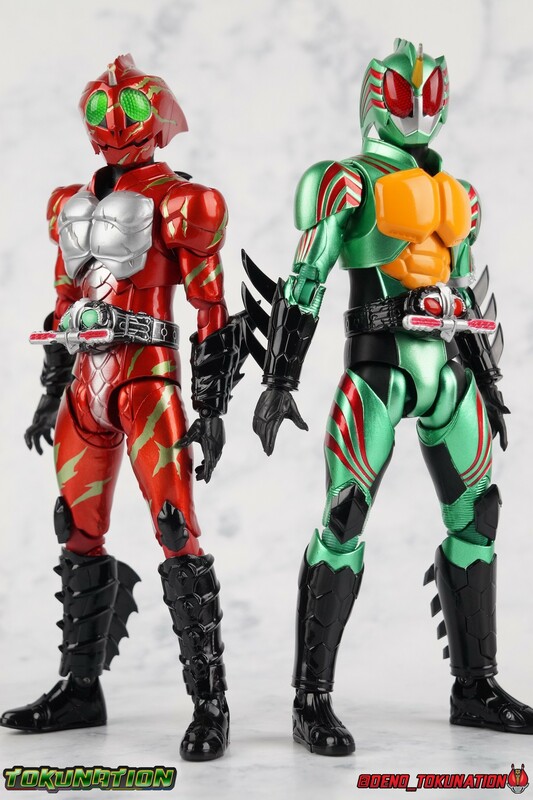 But frankly they're both wonderful representations of these riders. I'm very much ready for Amazon Sigma and Mole Amazon now. Even as a retail release Amazon Alpha included a ton of stuff, but this edition also includes some bonus effects! 4 - sets of hands. That's 2 types of open hands, and two sets of "holding things" hands that can be used for something I'm sure. 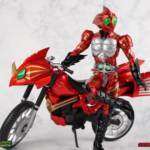 But Alpha doesn't include any Battler Grip weapons, and doesn't ride a Jungraider in show. So really the holding hands aren't superfluous here. 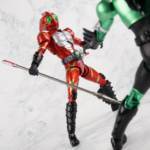 i let him borrow a weapon from Omega for my photos. 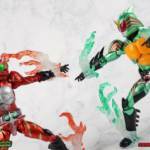 1 - Violent Slash effect part. It clips right on over the forearm blades on either arm and can be a little snug. So just be careful when removing it. 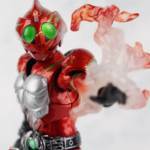 1 - Set of Red Flame Effects. 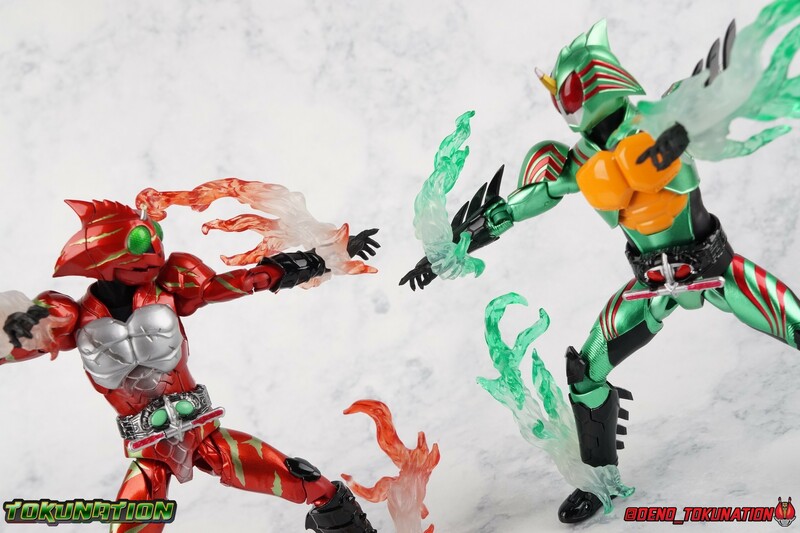 This set is a recolor of the popular Tamashii Flame Effects tailor made for Amazon Alpha's Amazon Japan edition. 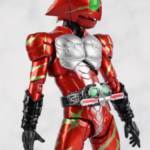 Amazon Omega also includes a set of them in Green to match his armor. 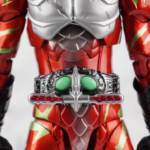 Obviously that's a pretty great pack of accessories, even if Alpha doesn't have a lot of variety the same Omega did. He still comes with quite a lot. 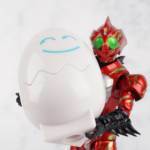 Though after seeing the upcoming Mole Amazon and his burger accessory I'm astounded that Alpha didn't come with some eggs to chow down on. S.H. 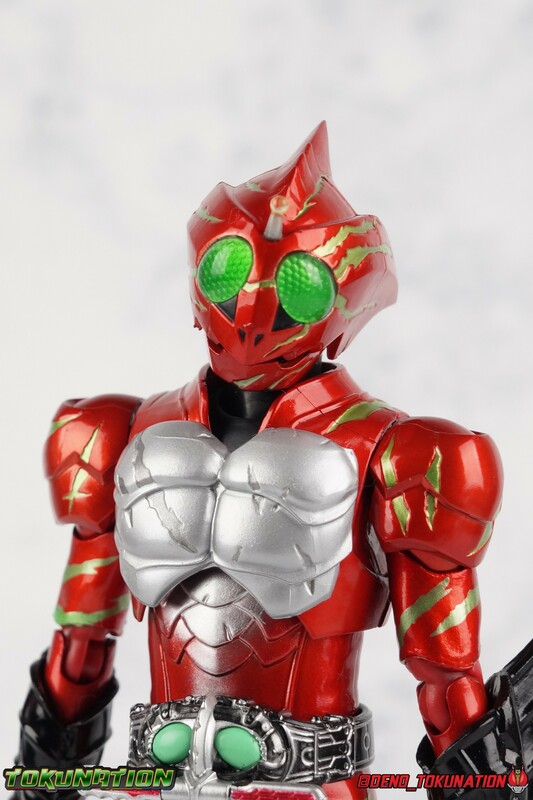 Figuarts Kamen Rider Amazon Alpha is a fantastic figure. 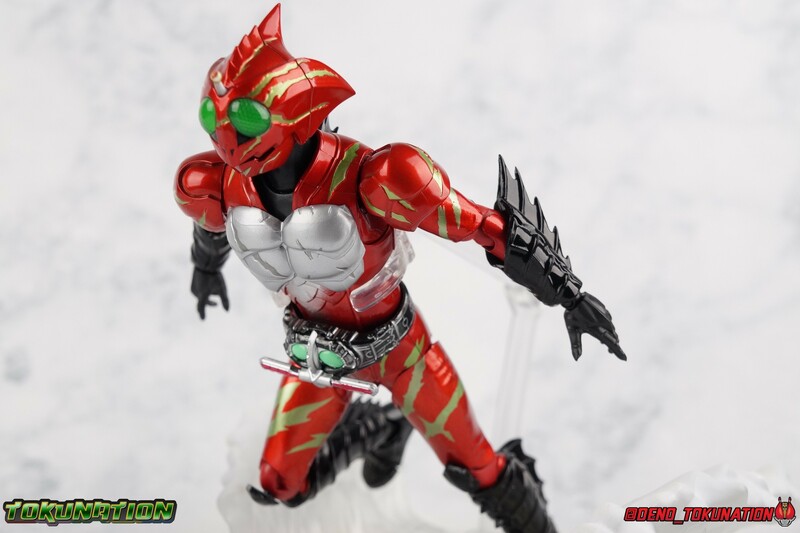 Like Omega it has some faults to it's design, more so in this case even, but overall this mold feels like it has more personality to it than Omega as well. While the ankle and hip issues are annoying, they're manageable. Amazon Omega is a figure I'd happily buy again, and Alpha is no different. 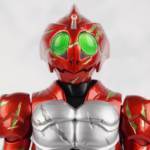 Given Jin's blindness in Season 2 of Amazons I'd be happy to re-buy blind Alpha with the white compound eyes, or a battle damaged season 1 finale Alpha, or hell even the driver-less first form Alpha sans scars. Honestly I'm just all in on Amazons. I'll take anything Bandai will give me. I'm very uch looking forward to Amazon Sigma right now, who will be released in July. What a great looking figure. 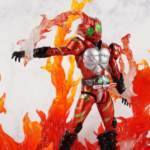 The pictures with him and Omega are fantastic, especially the ones where you utilize both of their unique flame effect parts. 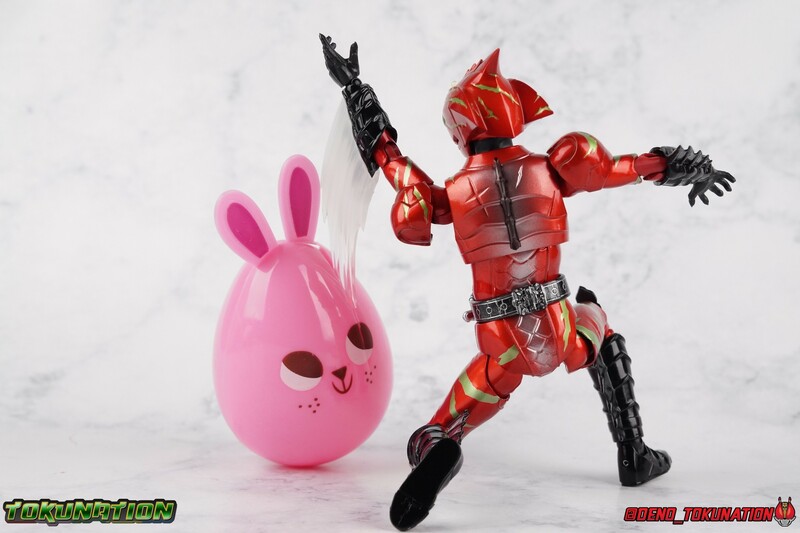 And the easter shots are cute and fitting - Easter has to be Jin's favorite holiday of the year! 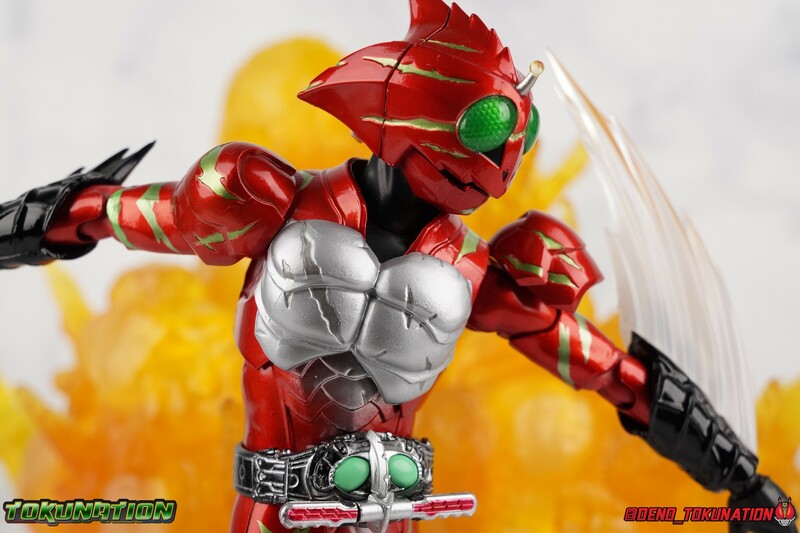 I can't wait to see how they do Amazon Neo now since it's basically Alpha's body type with a helmet and armor. It's gonna be awesome. 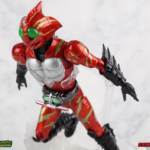 This figure looks amazing. The gallery is great and really makes the figures look great. I haven't seen the show yet, but its designs are great. You should definitely watch the show man. It's been a great series. Season 2 is really shaping up to be the same quality as the 1st. 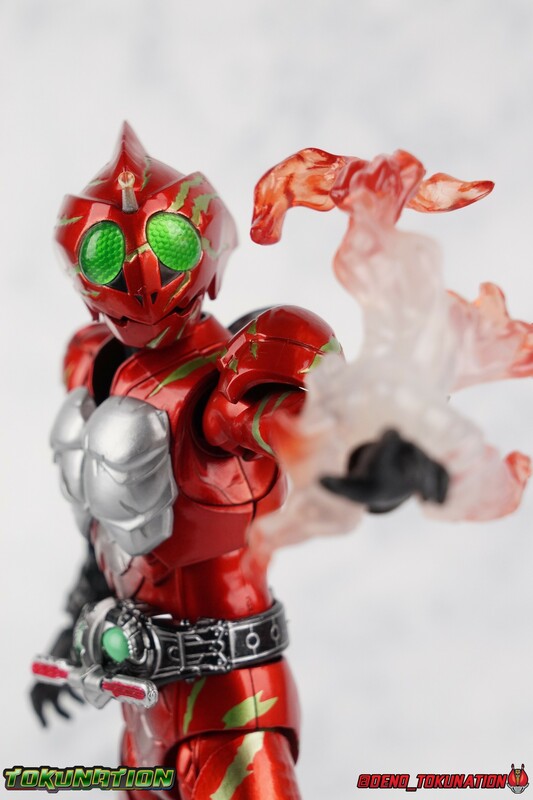 The figuarts for it have been great too. Can't wait for Sigma & Mole now. 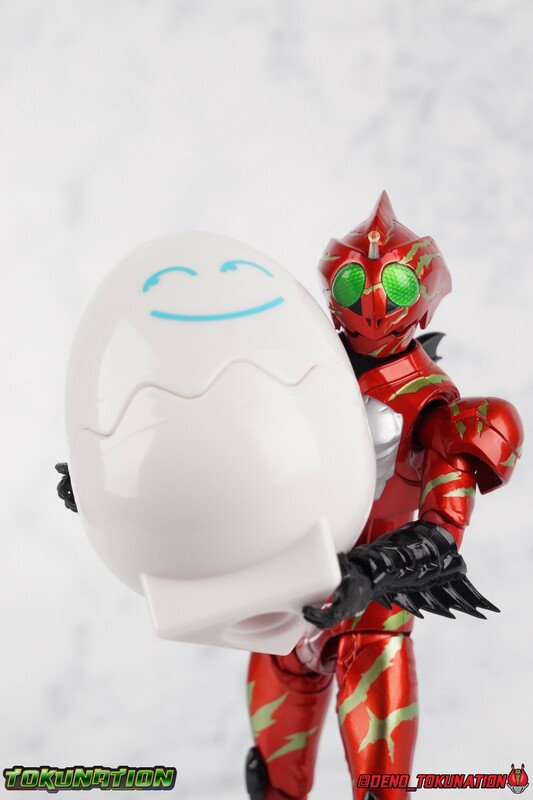 The picture of the clamshell makes it look like one of the hands is molded holding an egg. That's just my imagination, right?